Giant Trading Inc., the Holding Company of Radical Waters IP (Pty) Ltd., has recently been granted an exciting new European patent in respect of Chemical Free Starch Extraction and Modification using its Electrochemically Activated Water (ECA) technology. The patent relates to the treating of Starch-based products during processing in the industrial starch separation and extraction industry for achieving optimal microbial decontamination and chemical free starch extraction. Starch extraction and modification from raw grain and tuber products is one of the biggest markets in the food, animal feed and industrial starch industries internationally. Each day, thousands of tonnes of starch-based products are processed to extract the starch from it, before converting it to a variety of starch powders, premixes, pastes or liquids for use, inter alias, in beer production, meat and fish products, confectionary, jams and preservatives, syrups, paper and cardboard manufacturing, animal and aqua feeds, pet food and many other related applications. Production of the diverse range of starch-based products requires dedicated adherence to prescribed manufacturing procedures, which often include interventions with substantially noxious and potentially harmful chemicals for specific manipulation of the molecular features and characteristics of both in-process and end-product starch molecules. These chemical interventions include biocidal remedies to restrict the presence of pathogenic and spoilage micro-organisms which directly impact on the biosecurity of the product produced and thus the capacity to comply with internal as well as customer batch specifications. Optimal decontamination of these starch-based products is a critical factor in determining final product quality, not only from an economic perspective, but particularly for a human and animal safety perspective. Traditionally Suphur Dioxide (SO2) is added to prevent excessive microbial growth in the lukewarm steep water. The disadvantage of this is it can be harmful to humans, microorganism may become tolerant against SO2 after continuous exposure and SO2 may also impart an adverse colour taint to the intermediate and final products. Additionally, after steeping it is necessary to eliminate any traces of SO2 before further processing of the starch slurry. This is usually done by adding an oxidant such as benzoyl peroxide for neutralisation of the sulphur dioxide. Unfortunately, peroxide is an expensive chemical which could increase production costs. Furthermore, peroxide is highly corrosive and can cause damage to processing equipment, and also once added, any bacteriostatic effect will be removed and this can cause microbial proliferation during downstream processing. Radical Waters ECA Hygiene Solutions are produced through a process of electrochemical activation of salt and water within a specialised ECA Hygiene Generator. The ECA solutions, Anolyte and Catholyte are 100% approved for use in food environments as they are non-toxic disinfectant and cleaning solutions. In contrast to traditional chemicals, Radical Waters ECA Anolyte solutions are produced and applied at a neutral pH, i.e. neither too acidic nor too alkaline, which makes them completely safe when in contact with humans and as an effluent in the environment. The solutions can be used without any requirement for safety or protective gear. Bleaching a starch product with ECA Anolyte after it has been extracted from the source. Prior to steeping, washing the starch source with ECA Catholyte. Modifying a starch product by adding ECA Anolyte to it and increasing the Xylose content for partial conversion of sucrose into glucose and fructose. It is a new method of reducing the presence of superficial bacterial and fungal contaminants that may proliferate during steeping. Replacing the potential harmful currently used chemicals. It is a non-toxic remedy for in-process decontamination that is much more effective than molecular chlorine or hypochlorite. It will assist in reducing contamination of the extracted grain germ to improve the keeping quality and to limit constituent peroxidation which may contributes to rancidity of the extracted products. It is a food grade biocide used for downstream control of surface microbial biofilm growth. By using ECA it is possible to increase the percentage of pharmaceutical grade starch produced from food or industrial starch slurry. Figure 1: Anolyte antimicrobial efficacy at different processing points showing reduction in microbial growth between the two sampling days. 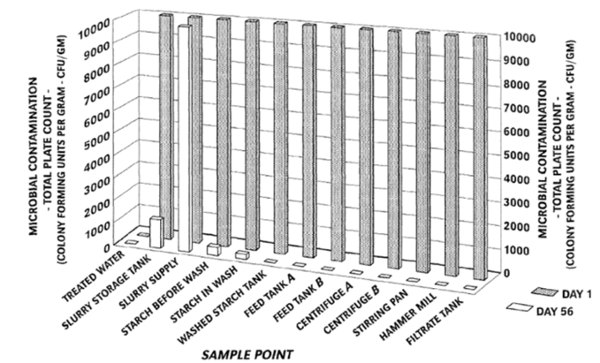 Results show that continuous administration of Anolyte into the starch slurry results in a progressive reduction in the level of microbial contaminants throughout the downstream intermediate and final starch products. Additionally, intervention with the Catholyte solutions substantially contributed to the continuous control of cross and recontamination of in-process starch products. The consequent production of an optimally consistent percentage of enzymatically converted starch within the endosperm.